1 Flags flutter. Red coats rush by. Dark horses race past you. A crowd cheers, and music plays. It is the Mounties' Musical Ride! 2 The Musical Ride is fun to watch. The Mounties work hard to get it right. 3 Mounties do not always ride around. They do not always wear red coats. They have a bigger job to do. 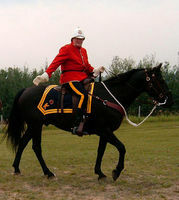 4 The Mounties were started in 1873. Prime Minister Macdonald heard about bad men in the West. The men were selfish. They wanted to make money. They did not care who they hurt to do that. They were hurting the First Nations. 5 Police were needed. The North-West Mounted Police were formed. They went after the bad men and stopped them. 6 The Mounties rode horses. The horses helped them move fast. Canada is a big land. The Mounties needed the horses. That way, they could help more people. 7 Soon, trains went West. Men rode on the trains. Mothers and children went West. They hoped for new lives. 8 Many people planned to be farmers. The Mounties helped them find their land. They helped them know what to plant.